Personally, I try not to eat while commuting. I'm less concerned about making a mess than I am having people watch me while I eat, counting the number of gummi worms I pop or criticizing the size or frequency of my bites. That said I am an occasional OC eater that has a sense of what can be safely eaten when you simply can't wait until you reach your destination. 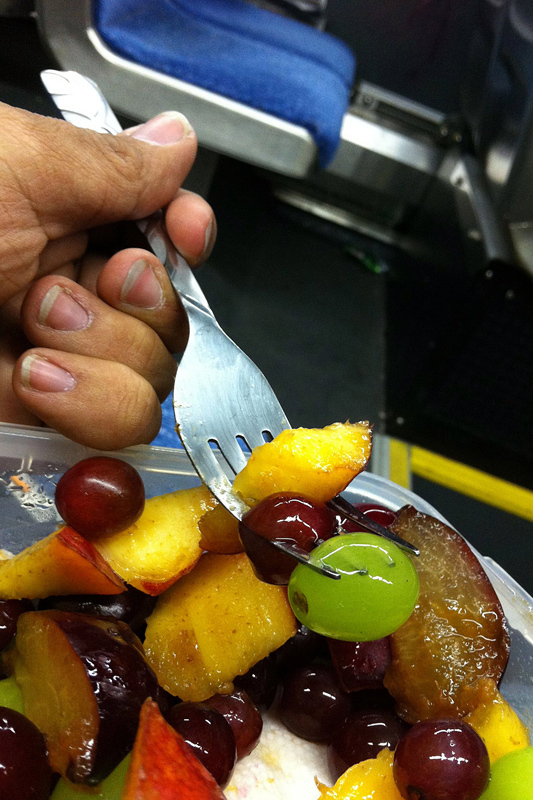 Whatever you eat, and wherever you eat it, please, please, please take your trash, cans, bottles, wrappers, peels, and the like with you — or at the very least, use the little white garbage can on each bus! Never eat standing up. One sudden movement and your Skittles can end up nestled in someone's hair. From someone that can lose things in his hair for days at a time, it isn't appreciated. No cutlery! No forks, no spoons, no chopsticks. Period. Avoid foods with strong odours. Keep fish and egg salad sealed at all times! Even KFC and McDonald's will fill the bus with a smell that will make half of your fellow commuters salivate and curse you, and the other half gag and curse you. Don't eat anything that needs two hands. Pizza, corn on the cob, shawarma, etc. No snack foods that are eaten by the handful. I'm talking popcorn, sunflower seeds, trail mix, and anything where half of it is liable to end up on the floor and seats. Nothing greasy, powdery, or sticky by nature. Not even if you have a pant leg for a wipe. No hot beverages, unless you have a strong travel mug with lid, and you sip only while stopped. Sandwiches. Just remember, the bigger it is, the riskier it becomes. Your homemade turkey sandwich (cut into diagonal quarters, crust optional) is probably ok, but your Subway sandwich is a no-go. Fruit and vegetables that can be held, sectioned, or sliced easily are ok. I'm talking apples, bananas, and strawberries, not pineapples, melons, nor blueberries. Take your peels with you! Larger bar-shaped snack foods or bite-sized snacks: crackers, granola bars, and the like. Bagels, muffins, and other single-serving baked goods, provided they are contained or are not crumby. Anything "to go". After all, it's designed to go!